Located in a quaint and touristic region with Camembert only 2km away.., Livarot 6km away, . . .
Large comfortable and beautifully decorated rooms in this super spacious Italian built . . .
Vimoutiers: Colombage style detached property, quiet Normandy village. Manageable garden. Excellent value! 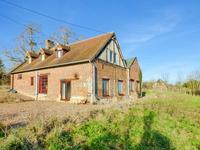 Delightful detached colombage style property located in a quiet village within a beautiful . . . In a peaceful hamlet, a splendid colombage style house with five bedrooms, two bathrooms, . . .